How do you practice happiness? For thousands of years philosophers, psychologists, and scientists have debated the issue of free will and self-determination. From hard determinists to free will libertarians the question has mainly centered around our ability to truly act of our own volition. In other words, how much choice do we really have over the trajectory of our lives? Or, as some philosophers would argue how much control do we really have over the choices we are free to make? Regardless of what we believe may drive our choices, most of us do understand that we can make choices. One of the more challenging choices we all face is our own happiness. 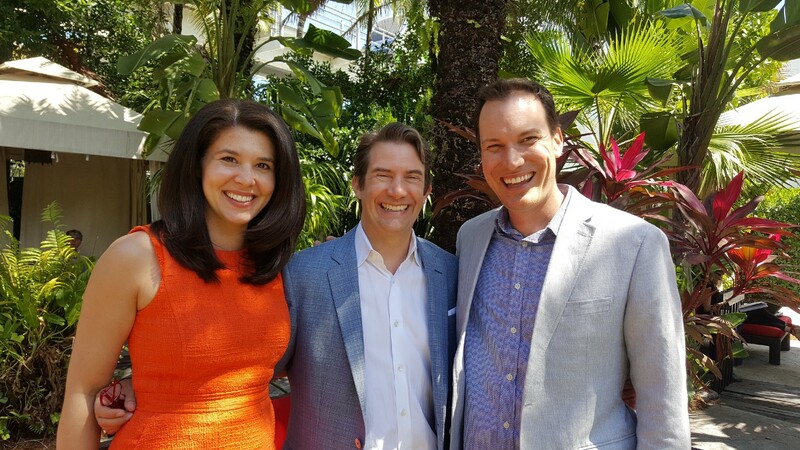 While attending the World Happiness Summit (#WoHaSu) in Miami I had the opportunity to sit down with two of the most prominent voices on the subject of happiness: Shawn Achor and Michelle Gielan. We discussed defining happiness and whether or not happiness is in fact a choice. Both Achor and Gielan describe happiness as the joy of moving towards your potential. Achor believes, “Happiness implies a positive mood in the present and a positive outlook for the future.” In other words, happiness is a combination of how positive you feel now and how positive you feel about where you are going. One of the challenges with moving towards potential is having an awareness of what that potential is or what it could be. Gielan explains that you must “acknowledge that it’s a journey, a journey that provides us with joy. And, realize that the journey doesn’t include just high moments, but also challenges along the way.” Essentially, happiness is about finding opportunities throughout our lives to grow towards our potential while finding joy in the midst of that journey. Achor explains, “I think the key is to use the joy I feel right now to move me towards these goals, but I don’t need to necessarily get there in order to feel happy. I can feel happiness today.” He adds, “That’s why I love this definition of happiness because it steers away from complacency.” Complacency can come in the form of feeling fine right now in the present moment, which may cause you to stop moving forward towards your future. Once you stop moving towards your potential you can lose your sense of purpose. At this point apathy can set in and derail you from happiness. The two researchers both agree we all have choices when it comes to where and how we focus our attention. Sometimes the right choice isn’t always the easiest choice. Life is full of distractions and those distractions can lead us astray. Achor notes that, “What I want people to realize is happiness can be a choice, and it’s something you can practice.” Happiness, like any other discipline, requires focus and effort. Without deliberate focus happiness can be elusive. Achor points out that it is important to recognize “if you’re feeling unhappy, that’s not failure,” it’s just a temporary state that can be remedied. Part of the remedy is making the choice to continue movement towards your potential. He goes on to say, “What we want to steer people away from is apathy, which is that loss of movement.” When it comes to helping steer people back on track Achor recommends using whatever hooks we have available to get them moving back towards their potential. One of those hooks can be reconnecting people with their purpose. Purpose is a powerful motivator and can drive the kind of engagement needed to break apathy. Like any discipline happiness requires focus and practice. Gielan believes that practicing happiness starts with being conscious of how we devote our mental resources and continually train our brains to focus on the positive. Both Gielan and Achor advocate simple practices like writing down three things you’re grateful for each day or sending a positive email to someone praising or thanking them for a job well done. Gielan explains, “By doing these habits, we’re constantly bringing our brain back to the positive, getting it to refocus on the good things that are happening and the people who are meaningful in our lives.” Like any habit the more we practice the easier it gets. One of Achor’s favorite practices is spotlighting the positive things the other person is doing. He notes it can be small things like saying “Thank you so much for loading the dishwasher” or “Thank you for giving me half an hour while you watched our son so I could go take a shower.” Just by acknowledging those simple behaviors the other person feels both acknowledged and appreciated. Sometimes it’s the simplest of gestures that have the most power. Choosing happiness isn’t always easy, but it’s a journey that is within our power to pursue. When it comes to spreading happiness, putting fourth the effort to make simple positive gestures is certainly a choice we can all stand to make more often.